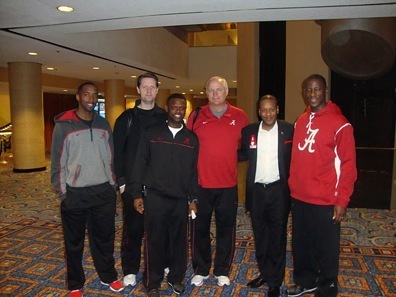 UANYC welcomed Tide basketball coach Anthony Grant and his coaching staff prior to Alabama's NIT semifinal game against Colorado. NEW YORK -- The Big Apple turned crimson Sunday evening as the Greater New York Chapter partnered with the Alabama National Alumni Association to host a welcome reception for Tide men's basketball coach Anthony Grant and his coaching staff at the Marriott Marquis in midtown Manhattan. Nearly 50 UANYC members and friends were in attendance to meet and greet with Coach Grant, associate head coach Dan Hipster, assistant coaches John Brannen and Tony Pujol and director of basketball operations Antoine Pettway, along with Director of Athletics Mal Moore and a host of athletics department and University administrators, prior to Alabama's NIT semifinal game against Colorado on Tuesday, March 29 at Madison Square Garden. Coach Grant, accompanied by his wife Christina and children Anthony, Preston, Makai and Jayda, and his staff spent nearly two hours interacting with UANYC members, expressing his gratitude for the support from the alumni in the Greater New York area. "Our Alabama family in New York City was very pleased to welcome Coach Grant and his staff to the city," said UANYC President Christopher Hollinger. "Indicative of the strong affinity our chapter continually shows for the University, we had a great turnout to show our support for our basketball team. The chapter is appreciative for the time Coach Grant and his staff gave us to extend some Big Apple-style, southern hospitality." Over 60 chapter alumni purchased tickets and will be at the Garden on Tuesday to cheer on the Tide. The game tips off at 9 p.m. and will be televised live on ESPN2.